Coconut water kefir is incredibly healthy and packed with vitamins A, B6, C, E and K, minerals, and electrolytes. It is also abundant in beta-carotene, riboflavin, thiamin, niacin, pantothenic acid, and folates. Moreover, scientists claim it to be healthier than pure kefir, because it has no casein or lactose. These both are known to be the ‘bad stuff’ in dairy products. This is quite a huge advantage, and it helps the body to break down nutrients more easily, which is great for your digestive tract. You can make your coconut water kefir in 3 great ways. You can either use kefir as a starter, then you can use kefir starter culture, or you can you can use kefir grains, of course if you are able to find any. Keep in mind that using kefir grains is the easiest method of getting the original coconut water kefir, plus you do not have to spend a fortune to get the ingredients you need. It does not really matter what kind of grains you use. Both water and milk kefir grains work well. 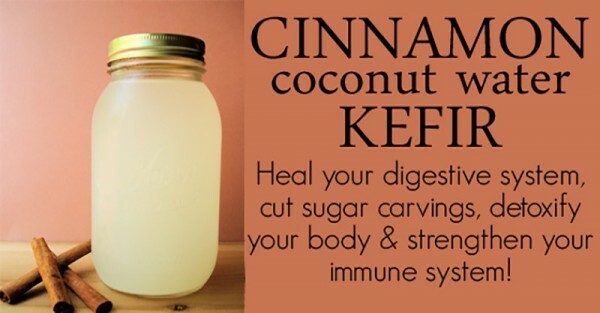 Pour your fresh coconut water in a half gallon jar. Throw in your kefir grains. Put the lid on, and let the liquid rest for 48 hours, but make sure you do not forget it. Longer fermentation may make the jar explode, and you do not want that, right? You should also keep in mind not to close the jar too tight. Once your grains have fermented, you should notice how your coconut water has become much lighter. You should see the grains floating on the surface once the fermentation has finished. Take them out, and the good thing is that you can re-use them for another batch, but you may want to do that right after you finish the first one.